Our contemporary life styles have made time-saving concessions in the kitchen a necessity, but we are not willing to sacrifice the quality of the meals we serve to our families. For those of us reared in the tradition of fine Italian cooking, and for countless others who love the traditional dishes of Italy, there is an alternative. That alternative, well known to thousands in the Delaware Valley, is the superb line of P&S products. 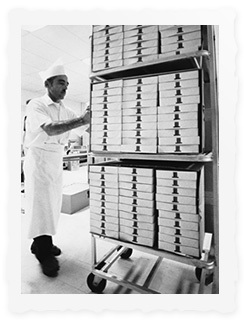 The growth of P&S Ravioli Company is the result of a “labor of love” performed by the DiGiacomo brothers, Primo and Secondo, who emigrated from Abruzzi, Italy in 1960. A small store at 22nd and Moore Streets in South Philadelphia was the beginning of a success story that soon required a move to a larger headquarters at 26th and McKean Streets. Within a few short years even more space was needed, and in 1983 a new plant was built at that location, operating twelve hours a day, six days a week. Freshness is the key word in the P&S operation; to insure it, most of the pasta is sold in the seven P&S retail stores throughout the Delaware Valley on the day that it is made. Meat products are quick-frozen in a specially built freezer right at the plant. 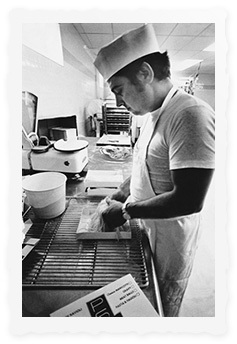 Quality is paramount: only premium durum flour, imported cheeses, and other ingredients are used. You can be sure that nothing artificial, no added colors or flavors, are used in the P&S products. As Primo assures us, “The food is the flavor.” So enjoy the quality line of P&S products, and you will experience the quality, freshness, and tradition we have combined to bring you the finest pasta that ever graced your table. Copyright © P&S Ravioli Company. All rights reserved.